Covered wounds heal faster than if left uncovered. 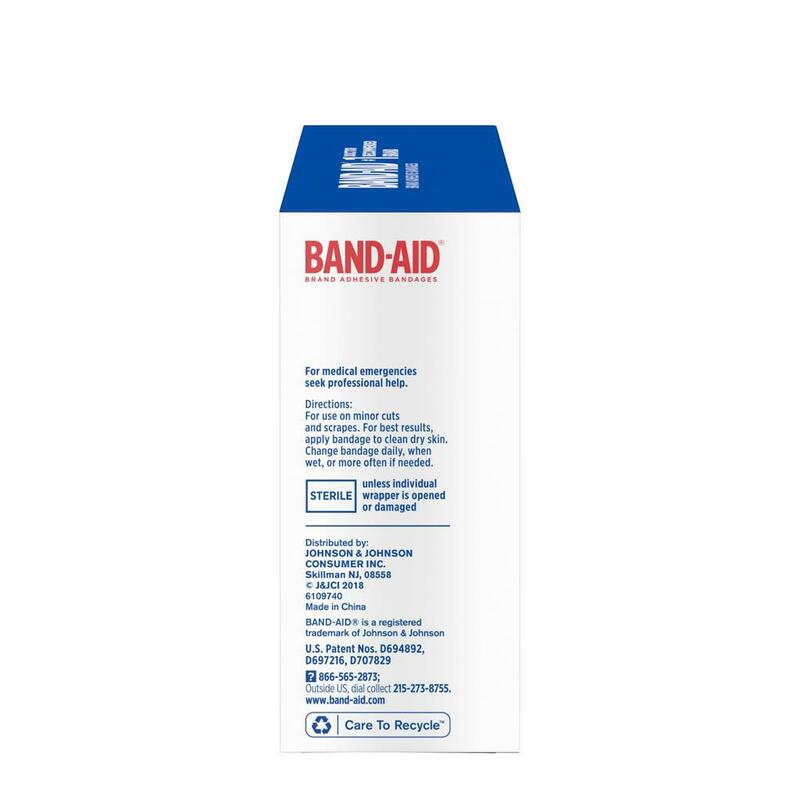 Try BAND-AID® Brand Flexible Fabric Adhesive Bandages, which cover and protect minor wounds. 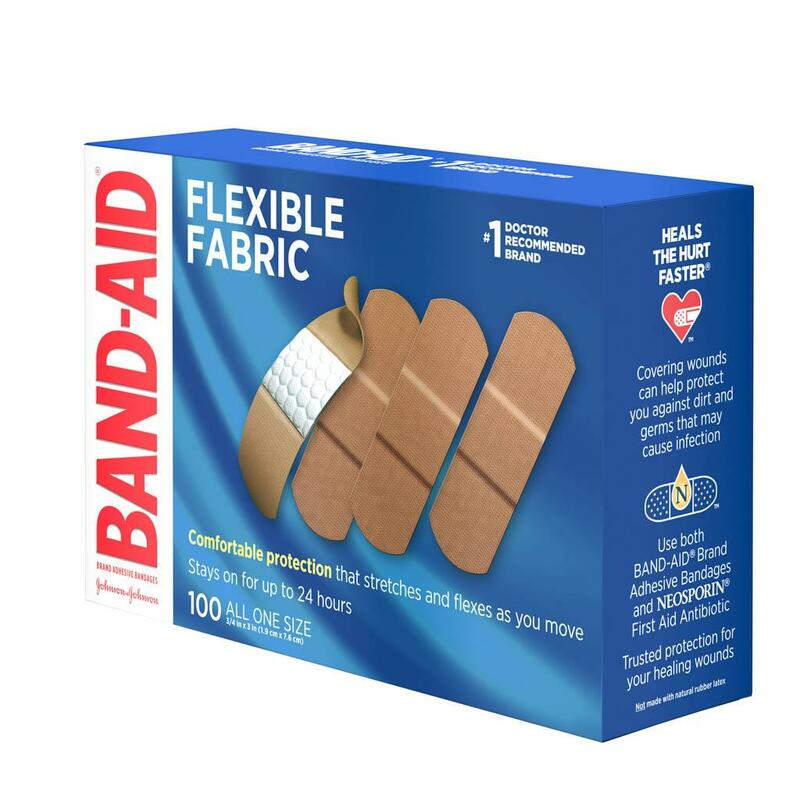 Made with MEMORY WEAVE® fabric for comfort and flexibility, these BAND-AID® Brand Adhesive Bandages stretch and flex as you move. Each sterile bandage features a QUILT-AID™ Comfort Pad designed to cushion painful wounds while you heal. 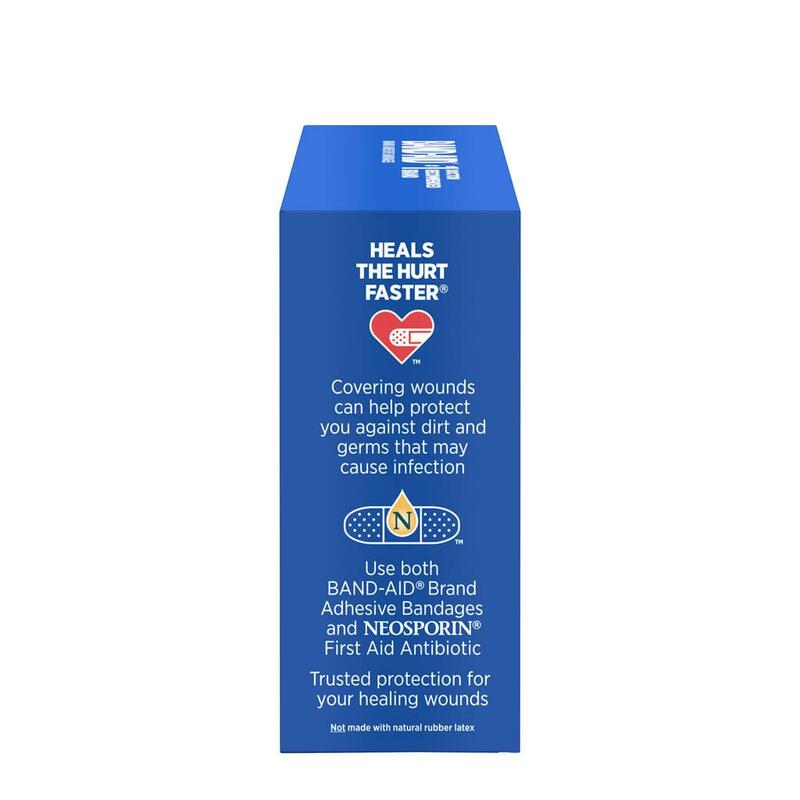 Made with a HURT-FREE® Pad, these comfortable bandages won’t stick to the wound, allowing for gentle removal. This package contains 100 flexible adhesive bandages, All one size. I agree that you need to bring back the comfort sheer band aids. They were the best Band Aid brand bandage. I actually prefer IKEA brand because they never cause a rash, but I can't get those anymore either. Most Band Aid bandages give me a rash, but the comfort sheer doesn't. Every time I find a good one, they are discontinued. We're very sorry to hear about the experience you've had with our bandages and we'd like to see how we can help. Please give us a call at 1-866-565-2873, Monday - Friday from 9AM to 5:30PM ET. We hope to chat soon! Please bring back Comfort Sheer! Have been trying to find your old version of Confort Sheer which are the best for dealing with issues with my toes. The new version does not work for me so I may as well just buy the generic brands from the big box stores. Please bring your old reliable back! We'd like to hear more about your feedback and see what we can do to help. Please give us a call at 1-866-565-2873, M-F from 9am to 5:30pm ET. Hope to hear from you soon! I am very disappointed in these new bandaids. Please please please bring back the old ones. Please Band-Aid, bring back Comfort Sheer. Those were the best band-aids ever. I bought and have used about half of a box of 100 - 3/4" X 3". Now, I need a smaller size. Most online places, I can't even determine the size, much less find it!! These are not good. Please bring back the Comfort Sheer!! The ~sheer plastic strips~ are inferior to the Comfort Sheer band aids, and are in no way an acceptable replacement. The ~sheer plastic strips~ are made of unpleasant plastic material, and are uncomfortable as the plastic does not mold to the shape of the human body, and do not last for long, they fall or peel off. 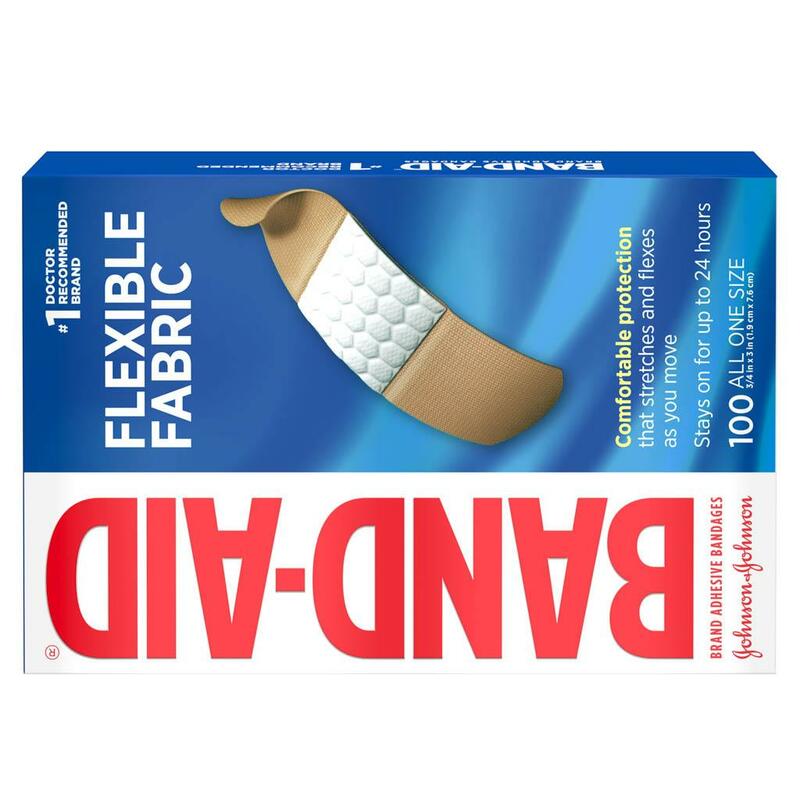 The ~flexible fabric~ band aids are far too rough and tough on the skin, and the edges fray. Comfort Sheer band aids are superior in every way, they adhere to the shape of your body where applied; they have a delicate texture needed for injury sites, and are made of an excellent yielding fabric like material on the upper surface and a quilted pad underneath to cover the injury, and they adhere extremely well to the skin. Comfort Sheer band aids are perfect. Please listen to your customers Johnson & Johnson, and produce more Comfort Sheer band aids - your customers are waiting to buy them. I will also be looking for a new band aid brand for small injuries after decades of brand loyalty to Johnson & Johnson if I don't see Comfort Sheer band aids for sale where I shop. We appreciate your feedback! We'd like to hear more from you. Please give us a call at 866-565-2873. We're available Monday through Friday, 9am to 5:30pm ET. We look forward to speaking with you!